Located at Shingu-cho, Ehime Prefecture, Hydrangea Village (Ajisai-no Sato) is the most famous hydrangea spot among those in Shikoku region. 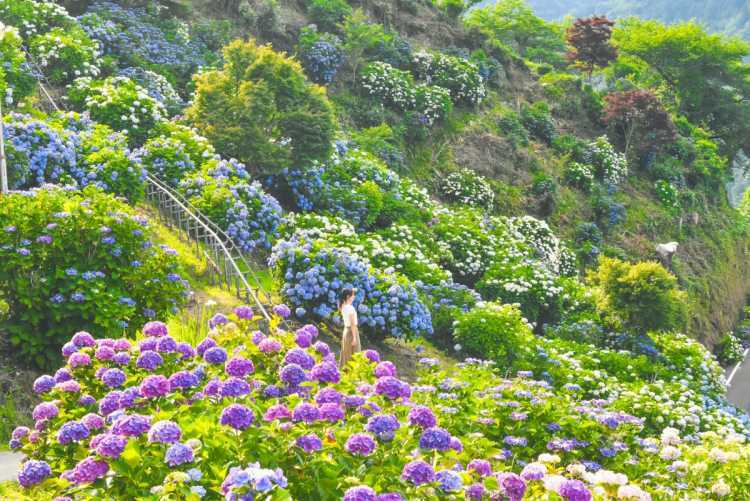 You can see the great view of as many as 20 thousand trees of hydrangea on the mountain slope. What's more, Shingu is known as a misty town, you may be able to see a fantastic scenery of hydrangeas and mist.◎You can climb the hydrangea slope by monorail. Shingu Hydrangea Festival in 2018 is on June 24th. If you come by car from Shingu IC, there're some narrow road. No admission fee.